Sometimes it pays to look down, instead of up or around. About halfway through Lent, as I turned the corner into St Margaret's Road, I glanced down and saw this bare scrap of a twig, blown down by the wind and lying inches from my approaching feet. Its shape instantly reminded me of some of the images of crosses I had seen on social media, especially around Ash Wednesday. Yes, it lacked a figure, but there was something in its bareness and simplicity which felt very Lenten: that, and the fact that it was lying at my feet, a tiny gift waiting to be picked up, meant I had no hesitation in taking it home, where it spent the rest of Lent lying beside the candle I light when I pray. And then, on Holy Saturday, again as I was walking home after more windy weather, my downward glance caught sight of this scrap of pine tree lying in my path. There was something in it which spoke to me of exuberance and exultation; of arms joyously thrust up in victory... and, in those tiny flowers, of promise and new life. 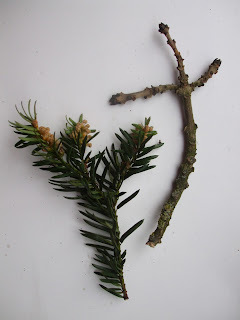 So I brought it home and laid it beside the twig - and in an instant, the twig-cross moved from starkness to dancing, from Lent to Resurrection. 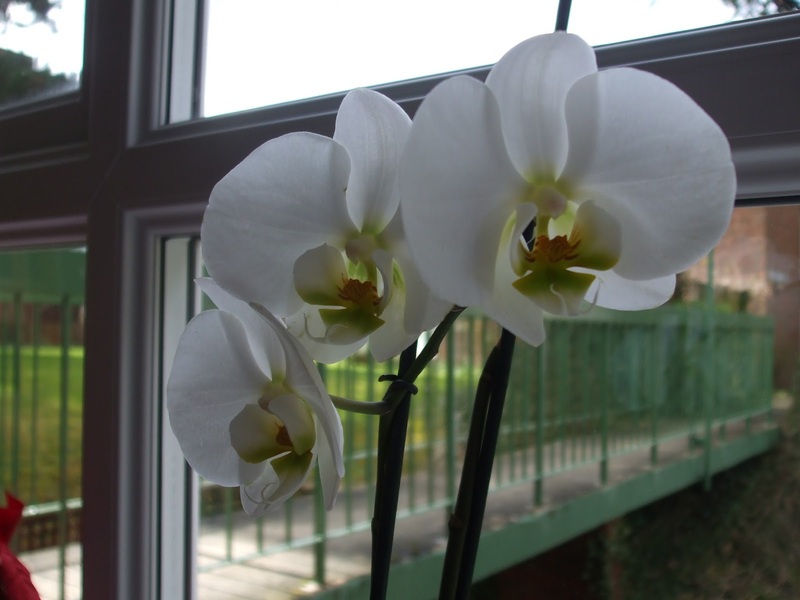 Meanwhile, on a nearby windowsill, my orchid has continued to bloom. Six weeks ago I wrote about the fact that it had been blooming continuously since October, and predicted that it would continue do so as we entered March. 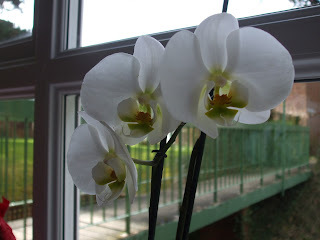 Well, March came and went, and the orchid only started shedding flowers mid-month. It's now April, and though most of its flowers have shrivelled and fallen off, three are still clinging on to the main branch - and clinging on to life. They are the mighty three, ensuring that a plant which started flowering in autumn has not only lived to welcome spring, but has lived on in full, flourishing style!